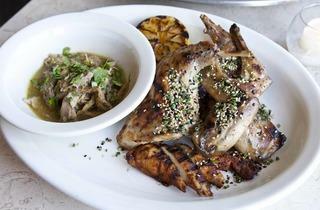 Normally a springtime favorite, rabbit dishes are showing up at NYC restaurants as roasts, stews and more. New York City chefs have bunny on the brain. 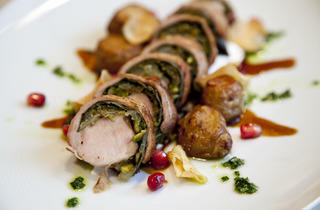 This fall, local toques are taking advantage of the meat’s versatility, serving it stewed, roasted and stuffed. 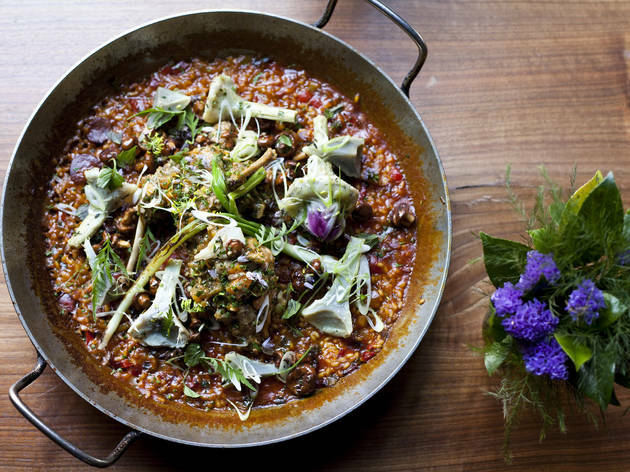 Hop on over to these NYC restaurants to give the rabbit dishes a try. Chef Sara Kramer puts every piece of the animal to work in this three-part feast: Legs, first confited in duck fat, are finished on the grill for a smoky char; seared saddle is dusted in hawaij, a fragrant blend of turmeric, cardamom and black pepper; and the belly is simmered with tomatoes and onions until tender. 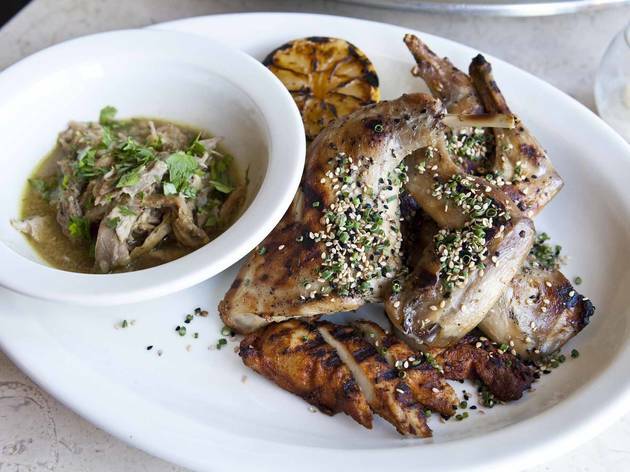 Rounding out the meal—which is inspired by owner Sara Conklin’s Lebanese heritage—are accoutrements like a pickled vegetable plate, luscious preserved-lemon yogurt and buttery griddled flatbread that’ll have your greasy fingers reaching across the full table for more. • 718-389-0640. $72. As in the 19th-century version of paella valenciana, rabbit takes on a leading role in Jamie Bissonnette and Ken Oringer’s modern rendition. 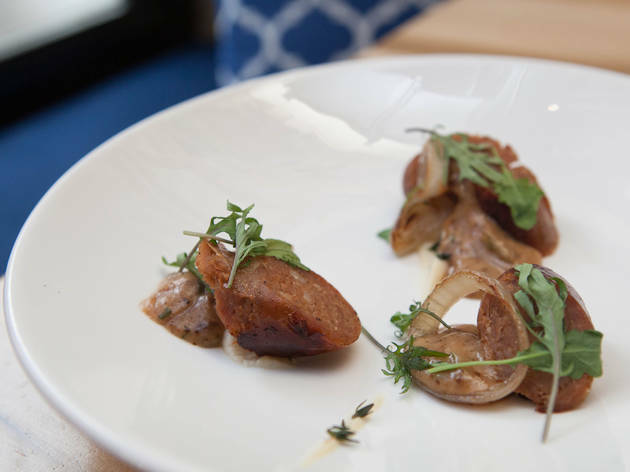 The toques braise Connecticut-raised meat in an onion-and-garlic chicken stock before adding it to short-grain calasparra rice with plump Burgundy snails. 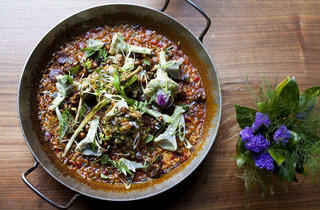 A hit of pimentón de la Vera (Spanish paprika) adds smoky depth to the richly aromatic dish. • 212-691-2360. Small $34, large $68. 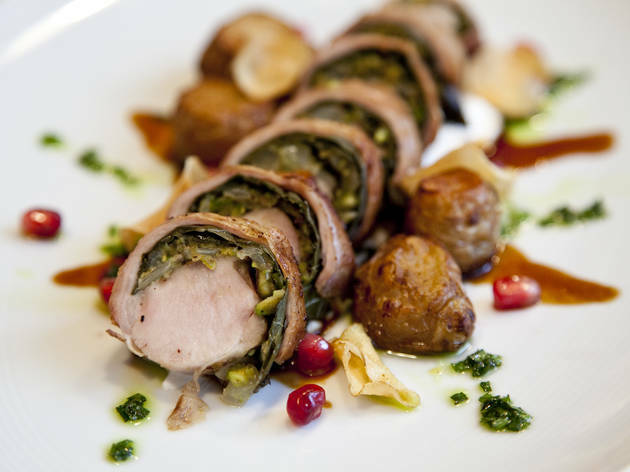 In this elegant plate, Anita Lo turns dolmas inside out, layering brined grape leaves, crushed pistachios and sautéed onions onto deboned saddle (rabbit loin) before it’s rolled into a tight baton. Building on the Mediterranean flavors, she cuts the moist, pan-roasted hopper into neat medallions and serves them with a creamy, lemon-infused yogurt and refreshingly tart pomegranate seeds. • 212-741-6699. $37. 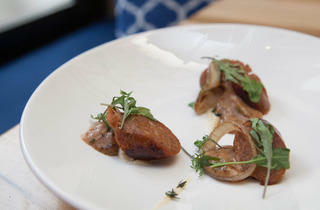 Chef Richard Kuo gives rabbit the frankfurter treatment at his downtown hot spot. Bone marrow and cheese rinds keep the snappy, garlic-spiked links moist, while a cabernet-sauvignon vinaigrette and petite kale add zip. • 212-837-2370. $16. 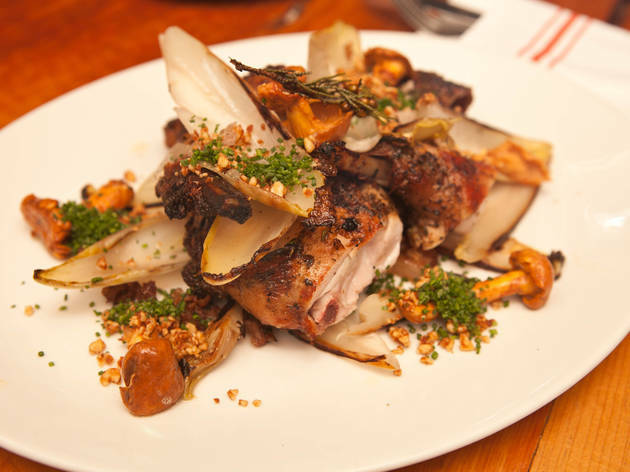 At this rustic Italian restaurant-market hybrid, chef Justin Smillie brines Whiskey Hill farm rabbit for 12 hours to lock in moisture, then pats them down with a dijon-anchovy-and-sage rub. 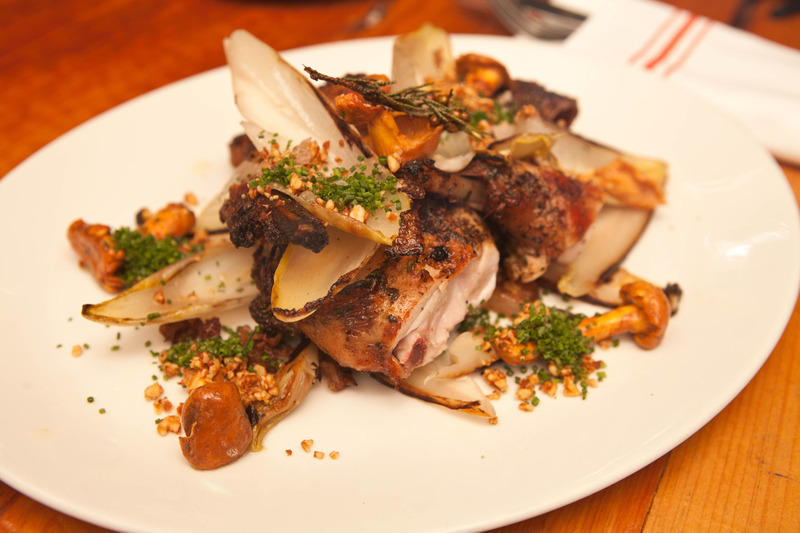 Pulled from a wood-burning oven, the succulent meat is crowned with winter vegetables, including lightly singed endives and meaty, butter-steamed chanterelles. Crushed, agave-glazed almonds finish the hearty dish with crunch. • 212-837-2622. $39.